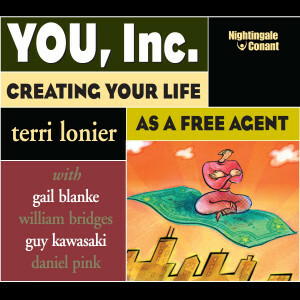 Terri LonierTerri Lonier is the nation's leading expert on solo entrepreneurs. A successful independent professional since 1978, she has spoken widely on this national trend, and her work has been featured in numerous national publications, including The Wall Street Journal, Fortune, Business Week, and Fast Company.She is also a frequent media guest, having appeared on CNBC, CNN/fn, the BBC, and radio programs nationwide. The author of five books, Terri is currently president of Working Solo, Inc., a strategic consulting firm that advises major U.S. corporations on how to access and communicate with the rapidly growing SOHO (small office/home office) market. Gail Blanke is president and CEO of Lifedesigns, a company committed to helping people design and live the lives of their dreams. She is former senior vice president of Avon Products, Inc., and launched their widely acclaimed Breast Cancer Awareness Crusade, which has raised more than $25 million dollars for community outreach programs. She is also the author of the best-selling book, In My Wildest Dreams. William Bridges, Ph.D., is a world-renowned speaker, author and trainer in the field of organizational development. He has spent 20 years guiding individuals and corporations through the maze of organizational transition. In the U.S., his clients have included Motorola, Intel, and Hewlett-Packard. He is the author of nine books, including JobShift and Creating You & Co. Guy Kawasaki is the CDO of garage.com; a firm that assists high-tech startup companies locate capital using Internet resources. Prior to this position, Guy was an Apple Fellow at Apple Computer, Inc., where he was instrumental in engineering the success of the Macintosh. He is a noted columnist and speaker, and is the author of seven books, including How to Drive Your Competition Crazy and Rules for Revolutionaries. Daniel H. Pink has become the nation's leading chronicler of the free-agent phenomenon. A Contributing Editor at Fast Company, and Editor and Publisher of FreeAgentNation.com, he is now writing a book about the free-agent economy. Before declaring free agency himself, Pink served as chief speechwriter to former Vice President Al Gore and as special assistant to U.S. Labor Secretary Robert B. Reich.